Ferrets are carnivorous mammals belonging to the weasel family. Their name is derived from the Latin word "furittus," which means "little thief" and refers to their habit of secreting away small objects. 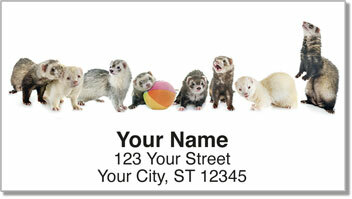 A group of ferrets is called a "business." Ferrets have been domesticated for at least a couple thousand years, but they've never gained the kind of popularity as household pets that cats and dogs enjoy. But you've never been one to go along with the crowd, anyway, are you? 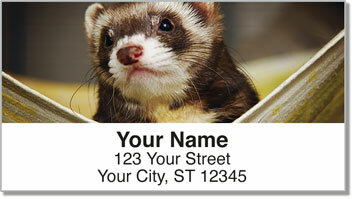 After all, if you want to keep ferrets, it's nobody's business but your own! 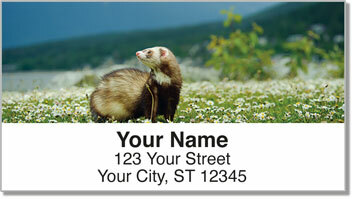 Now you can get these cute Ferrets Address Labels from CheckAdvantage. 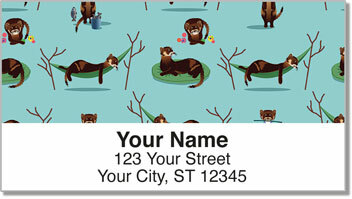 They match our Ferrets Personal Checks, so no matter what you send in the mail, you'll show your love for your favorite furry friends. Make both personalized products yours today!